Cetis Announces New Corporate Campus And Warehouse Facilities. Situated at the base of Pikes Peak in Colorado Springs, Colorado, Cetis, Inc., manufacturer of Teledex®, TeleMatrix® and Scitec® brand analog and VoIP hotel phones, has announced the purchase and opening of the company’s new 4.3 acre corporate headquarters campus located at 4975 N. 30th Street. Located in the area known as the Garden of the Gods commercial district, the new Cetis corporate campus operates as a mixed-use space designed for Sales, Operations, Administration, and Warehousing. Neighbors include Verizon, Agilent, Fedex, Chefs Catalog, Entegis, and Aeroflex to name a few. “We elected to invest in this new Cetis world headquarters campus to help meet the demands of our growing Americas installation base, and more vigorously support Cetis hotel customers and partners, who are helping us grow. We currently ship from 6 global distribution centers, including the new corporate facility where we stock an average of 300,000+ hotel phones,” states Dr. Bing N. Sun, Founder and CEO, Cetis, Inc.
Cetis is a preferred or approved supplier of hotel phones to the world’s leading hotels, hotel franchise corporations, and hotel management companies. In Las Vegas alone it is estimated that more than 250,000 Cetis hotel phones are installed in star-rated hotels. 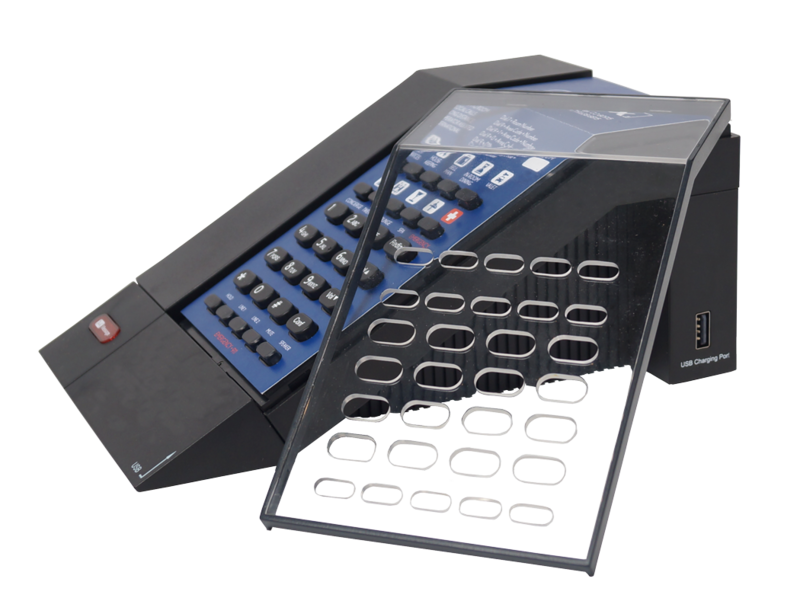 Formed through the 2006 merger of Scitec and TeleMatrix, and the 2009 acquisition of Teledex assets, Cetis introduced the ﬁrst Teledex brand hotel phones with programmable guest service keys and a customizable faceplate area. Teledex Diamond Series hotel phones continue to be recognized as the most popular hotel phones in the world. Today, Cetis ships more than 3,000 hotel phones daily, and supports 30+ million phones globally, including 300,000+ hotel VoIP phones. For additional company and product details, call +1.719.638.8821, write info@cetis.com, or click here to visit the Company page. NEC And Cetis Sign Telephone Distribution Agreement. NEC and Cetis sign distribution agreement. Present are Toine Moerdijk, Business Manager NEC Hospitality Solutions (left), Paul Kievit, President and Head of NEC Enterprise Solutions EMEA (left center), Hui Du Le-Ngoc, Managing Director, Cetis (EA), Ltd. (right center), and Philip Ofori, Sales Manager, Cetis (EA) Ltd. (right). NEC and Cetis have signed a distribution agreement for the supply of hotel guestroom telephone sets to NEC business partners and sales channels in EMEA. The agreement was signed during the NEC EMEA Partner Conference 2015 held in Athens, Greece in June.During a special Gala Dinner, Cetis received the NEC Best Complementary Solution Partner award. The new NEC/Cetis distribution agreement includes Teledex and TeleMatrix brand hotel phones, which have been certified by the top 10 hotel chains worldwide and are an important complement to NEC’s Smart Hospitality solutions portfolio. NEC business partners may contact their channel director for availability of the Cetis telephone sets pending their inclusion in the NEC logistics process. Cetis Bluetooth And USB Charging Solutions Demonstrated at HITEC. M Series Bluetooth hotel phones keep guests connected to stream sound, place and receive calls over their own cell network, and charge phones and tablets via built-in USB charging ports. Need a cordless handset in the room without the cost? The guest may pair to M Series Bluetooth and use their smart device as the remote cordless handset in the room! M Series Bluetooth rocks! Guests may pair their smart device to stream music via the high-fidelity M Series Bluetooth SoundSystem. Saves space by eliminating the need for a separate music playback device in the room. 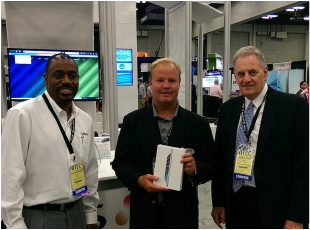 Robert Persan, MIS, Hospitality Account Executive, FisionStay, winner of the Cetis iPad Mini 2 drawing at HITEC 2015, receives his new iPad from John Grubb, V.P. Sales & Marketing (right), and David Johnson, Senior Sales Director (left). Teledex M Series Standard Phones Feature Built-In USB Ports. 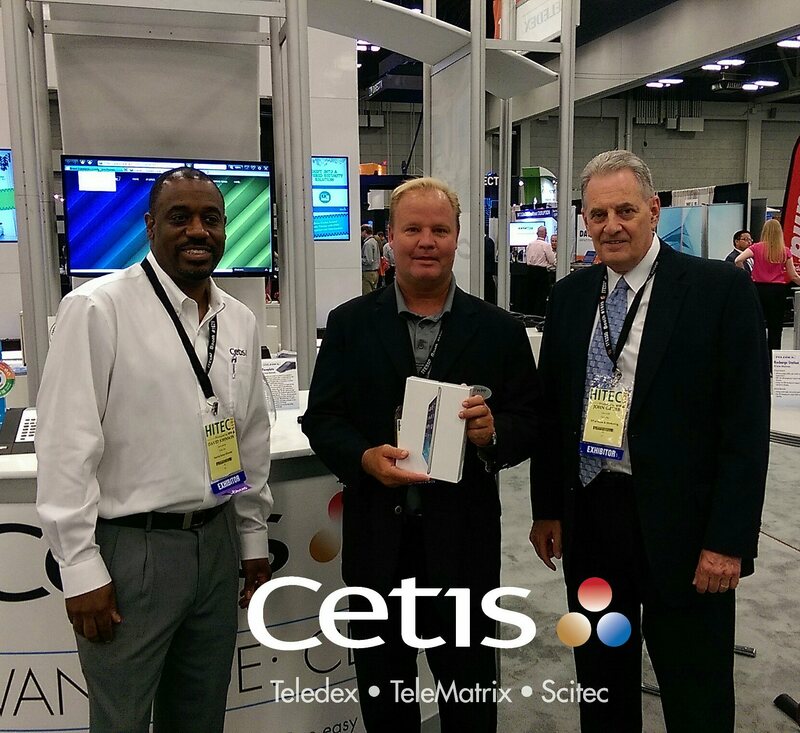 During HITEC 2015, Cetis debuted Teledex M Series Standard hotel phones available in analog, VoIP, corded, and cordless configurations with built-in USB charging ports on both the phone and remote handset kit. 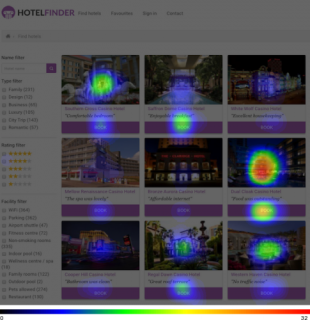 New Study Maps Hotel Attributes Impact On Travel Booking Decisions. Consumer research explains how travelers choose to book hotels within various travel contexts. Click here to read the entire article at Hotel-Online. Full details on what attributes prompt a traveler to book in each context are available in the free report here. Research studies continue to report that guests are bringing 4 to 5 smart devices into the guest room. Are you ready? Choose Teledex M Series Bluetooth and M Series Standard hotel phones with built-in USB charging ports engineered to charge both smartphone and tablet devices. Teledex M Series phones are equipped with two USB charging ports, including two on the right on M Series Bluetooth, and one on each side of the phone base on M Series Standard telephones to help facilitate guest charging on the nightstand from either side. Ask your Cetis sales representative about Cetis USB charging solutions. 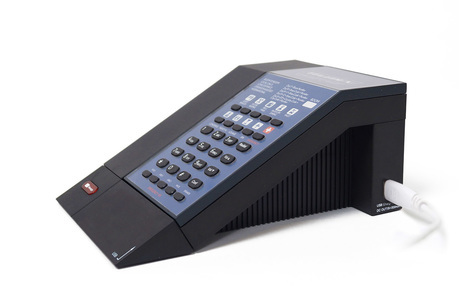 Teledex Diamond, the first, and still most popular hotel phone in the world, was introduced in 1990. Teledex I Series hotel phones were introduced in 2006 as the first VoIP sets developed specifically for hospitality applications. More than 300,000 Cetis hotel IP phones are installed and supported globally. 30+ million Cetis hotel phones are installed and supported worldwide. Cetis ships an average of 900,000 hotel phones annually.